Sothebys and Christies and others have described the MSS as very interesting and of clear importance to science and literature. They did not disagree with the valuation. Recently Watson of Watson and Crick (double helix fame) sold his Nobel Prize gold medal via Christies for around two million pounds. I am a Nobel prize nominee so my valuation is in the same range. I have a few enquiries on going with specialist auction houses who deal with contemporaries. Watson is a contemporary of course. Attached is a detailed description that I send the auction houses. Many thanks, the plateau has been steady for a decade so ECE is a new school of thought in physics with its own publishing system and educational system. The scientometrics can be used to measure all aspects of impact. No other institute or group has this quality of measurement. For example the ECE2 papers are already being studied at the rate of ten thousand times a year, all produced this year (2015). The Evans / Morris papers are being read at the rate of about eight thousand times a year and so on. I can see that referrals from the wikipedia troll site have stopped completely. They had been declining sharply for years. ECE is an intellectual authority of its own. The leading item is Felker’s chapter three in Spanish, on ECE quantum mechanics, being read at the rate of 10,500 times a year, followed by Barddoniaeth / Collected Poetry at about five thousand times a year, read and heard, then Autobiography Volumes One and Two. Astonishing and continued interest as your extrapolations predict. Congrats!! This is a paper which shows in various ways that the lagrangian and hamiltonian of special relativity produces precession of the perihelion. In Section 3 the results are illustrated incisively with graphics by co author Horst Eckardt. The paper concentrates on the computation and calculation of the momentum to angular momentum ratio discussed in several previous UFT papers. This is an application of ECE2 special relativity, of a unique and new generally covariant unified field theory whose field equations are Lorentz covariant. As usual the book is updated on the last day of the month before a key file is overwritten. Up to 28th Sept. for www.aias.us alone there were 74,581 files downloaded, 21.56 gigabytes downloaded,10,704 distinct visits, 52,789 page views, 2,977 documents read from 85 countries, led by USA, Germany, Romania, Argentina, Mexico, Russian Federation, Britain, Italy, Japan, ……. From the Webometrics and THES top twenty universities in the world there were visits from: Harvard*, Penn State, Chicago*, Texas, Cambridge, Tokyo*, Berkeley, Columbia, Johns Hopkins, Texas A and M, Minnesota Twin Cities and ETH Zuerich (* denotes repeat visits as usual). As usual complete returns for September 2015 will be available in two or three days. There were 3154 files downloaded or hits from 471 reading sessions or distinct visits, 1.36 gigabytes downloaded during the day from private site extensive downloads. Main spiders baidu, google, MSN, yandex and yahoo. F3(Sp) 803, Collected ECE2 papers 732, Collected Evans / Morris papers 560 (est), Collected Scientometrics 546, Barddoniaeth / Collected Poetry 378, Autobiography Volumes One and Two 367, Proofs that no torsion means no curvature 220, Principles of ECE 195, Eckardt / Lindstrom papers 180, Engineering Model 168, UFT88 120, Evans Equations 113 (numerous Spanish), CEFE 79, UFT311 78, UFT321 78, Llais 45, UFT313 50, UFT314 38, UFT315 45, UFT316 49, UFT317 54, UFT318 56, UFT319 63, UFT320 47, UFT322 57, UFT323 47, UFT324 72, UFT325 75, UFT326 65, UFT327 14 to date in September 2015. Institute of Physics University of Sao Paolo Brazil UFT149(Sp); Pontifical Bolivarian University Colombia Antisymmetric Connection and Refutation of Einsteinian GR (Sp); geology University of Oviedo Spain F1(Sp); Dragana Campus Dimokritio University Thrace Greece Essay 24 Derivation of the Pauli Exclusion Principle from the Fermion Equation; Italian National Institute for Nuclear Physics (INFN), Southern National Laboratory at Catania LCR resonant; Utrecht University Netherlands general. Intense interest all sectors, updated usage file attached for September 2015. The numerical methods and results for the special relativistic orbit can be used to solve for the Sommerfeld atom (1913) and Dirac atom (1927 / 1928) without the use of the crude approximations used by Dirac. He made these for the sake of analytical tractability, and they are very rough, the total energy is approximated by the rest energy for example, and it is assumed that U << m c squared. The Dirac equation has been improved into the ECE fermion equation by the AIAS group, removing negative energy and the unobservable Dirac sea. I will proceed to write up my sections of UFT328, and UFT329 will probably deal with the Sommerfeld and Dirac hamiltonians and lagrangians. The former use O(3), the latter use SU(2) and the Pauli matrices, otherwise they are the same before quantization. The early quantization by Bohr and Sommerfeld (1912 to 1913) was replaced by Schroedinger quantization in the early twenties, and that was used by Dirac. They are both theories of special relativistic quantum mechanics. In ECE2, special relativity in one sense is also generally covariant, so the distinction between special and general relativity is no longer needed. The physics all becomes Cartan geometry. The true Sommerfeld orbitals are the quantized versions of the ones that appear in the following postings on this blog, with the gravitational potential between a mass m in orbit around a mass M replaced by the electrostatic potential between proton and electron in the H atom. This is a particularly interesting and important result, the graphics here vividly illustrate the effect of special relativity. The overall conclusion is the Lorentz covariant ECE2 theory allows the use of the familiar equations of special relativity, notably the hamiltonian and lagrangian. A numerical method of solution developed by co author Horst Eckardt leads to results that cannot be obtained analytically. This situation is similar to molecular dynamics or Monte Carlo computer simulation, where results can be obtained that are intractable analytically. So the numerical solution of the lagrangian of special relativty produces the true orbit. This method also produces the true orbitals of the Sommerfeld atom, the first relativistic quantum theory. The Einstein theory produces a ridiculously incorrect orbit if we expand our horizons form the seconds of arc perspective to the complete orbit. The Marion / Thornton approximation to Einstein gives a completely unphysical orbit that diverges. The x theory produces a precessing ellipse initially, but as x increases the orbit of x theory becomes the fractal conical sections, also discovered by the AIAS group. The fractal conical sections are mathematically valid, but they do not give the true orbit. So mainframes and supercomputers should be used to try to give a precise comparison of special relativistic precession with experimental data. Given the new principle of special relativity of recent UFT papers that v0 squared is bounded above by c squared / 2, special relativity gives light deflection by gravitation exactly. So these are historic advances in physics and cosmology. Special relativity also describes the fundamentals of the velocity curve of a whirlpool galaxy, where Einstein fails completely. So I will now proceed to write up UFT328, Sections One and Two. > orbital curvature comparable for example. 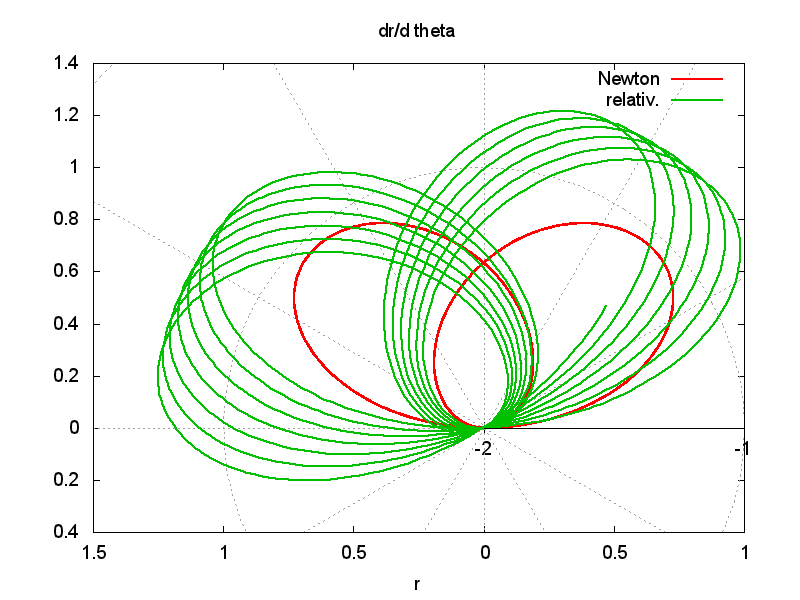 >> orbit (p0 in note 328(5)) in a relativistic context. >> Fig. 10 shows gamma(theta), this varies only between 1.00 and 1.03. >> at the aphelion. This also holds for p/L (Fig. 13). >> curves, for example extracting a precession parameter. These are excellent results and graphics, proving conclusively that special relativity can produce orbital precession. So orbital precession is not a conclusive test of Einsteinian general relativity, because it can be produced by special relativity. It is also known that Einstein’s mathematics are riddled with errors which are well known and can no longer be just ignored. To do that is unscientitic.These are major advances as can be seen from the intense interest in the latest UFT papers. I think that the best way forward is to use (p / L) squared and gamma from these computer results in Eq. (14) of Note 328(5). It is very interesting to see the difference between the relativistic and classical p / L. The orbital precession is very clear from these results. Also the graphs of r dot and theta dot are important and interesting. relativistic equation because this is not a constant of motion there. in note 328(5)) in a relativistic context. Fig. 10 shows gamma(theta), this varies only between 1.00 and 1.03.
the aphelion. This also holds for p/L (Fig. 13). for example extracting a precession parameter. Many thanks, a very useful check by computer. .
you are right, the term is correct. The computer gives a simplified expression without double fractions, see last two formulas. 1) Can you run this through the computer? If the rightmost term does not contain r, the dimensionality is wrong, because eps r / alpha is dimensionless. In eq. (15) the right-most squared term should not contain “r”. in (29) sin theta should be repaced by sin (gamma theta). In (39) the second row has probably to have 1+epsilon in the denominator, not 1+alpha. This note defines the precessing orbit as Eq. (15), so the ratio p / L can be calculated using Eqs. (15) and (17). This ratio can be compared with p / L from the lagrangian of special relativity Eq. (18) with gravitational potential (19), and can be compared with p / L from other theories, for example the x theory or the general precessing orbit (22). Finally, using the orbit (26), with x = gamma, the orbit (9) of special relativity can be deduced. So special relativity can be thought of as x theory with x = gamma, the Lorentz factor. This gives the precession (34), and delta theta can be calculated to be Eq. (44). At the perihelion Eq. (45) applies. In the next note 328(5) the ratio p / L will be calculated analytically by approximating the relativistic lagrangian theory, which leads to the relativistic Leibnitz equation of orbits and the definition of the relativistic angular momentum as a constant of motion. Knowing p / L analytically gives d theta / dr and the true orbit of specail relativity. The ratio p / L was computed by a scatter plot method by co author Horst Eckardt in UFT324 and UFT325. This is excellent news, especially as LENR started in the University of Utah. I think that Government and corporate funding should be poured into the development of devices such as this. They are historically equivalent to the development of steam power, followed by electric power, and your Thesis on the second industrial revolution is an excellent summary. I much enjoyed the walk to Hendy coal tip and I hope you have framed your piece of steam coal as a memento of the first industrial revolution. These are very good things. You are currently browsing the Dr. Myron Evans blog archives for September, 2015.